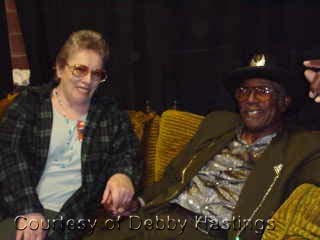 We gratefully acknowledge Debby Hastings for the above photo contributions of BO DIDDLEY and The Debby Hastings Band in concert and backstage at the opening of the Experience Music Project (EMP) interactive museum in Seattle, WA in June 2000. 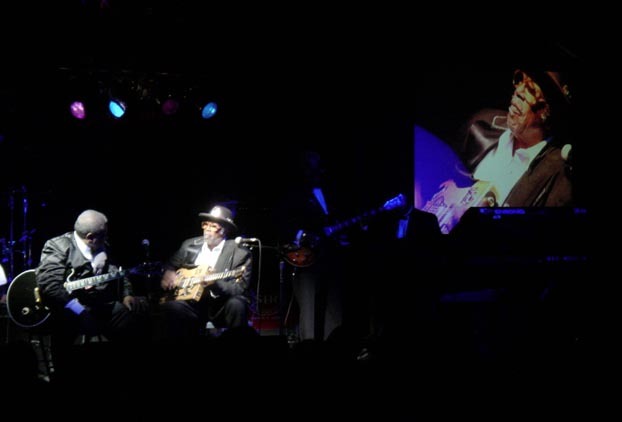 "About 4000 people attented the Rock 'n' Roots evening during the Avo Session Festival in Basel, Switzerland. Probably 3/4 of the tickets were sold. 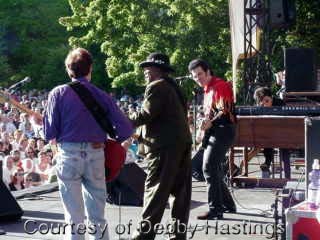 The show was taped by a Swiss TV Station named SF DRS and will be broadcasted on August 31st 2002. There were two big video screens beside the stage where we could see the performers very closely. Anyway, support act Hiram Bullock started at 8 PM, did a great show and played for 90 minutes. 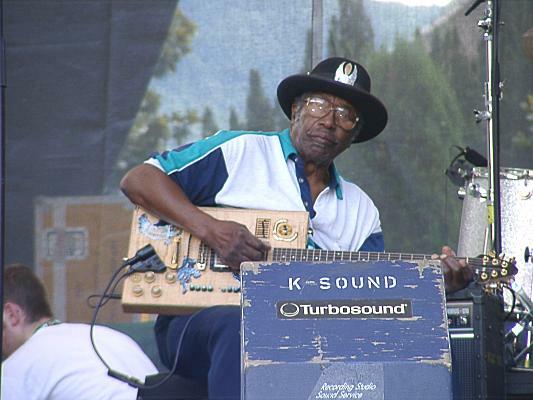 Then he told us he has to go cause of Mr. BO DIDDLEY coming up. 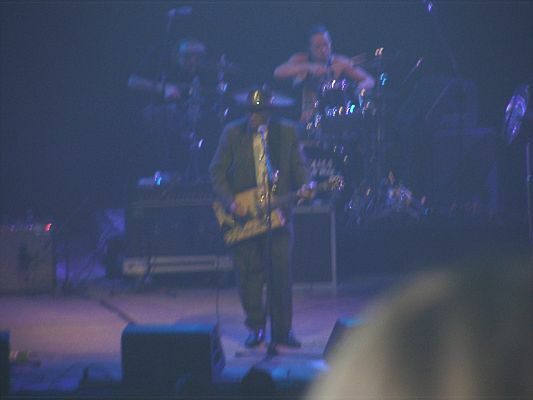 After a 30 minute break, BO DIDDLEY and The Debby Hastings Band entered the stage and opened with the famous BO DIDDLEY beat. His stage moves were very slow but he looked ultra-cool. And to be honest, I never saw him jump on stage or things like that on the old videos. It's just his style. Then he played, played and played... he just didn't stop. And here is the big difference. 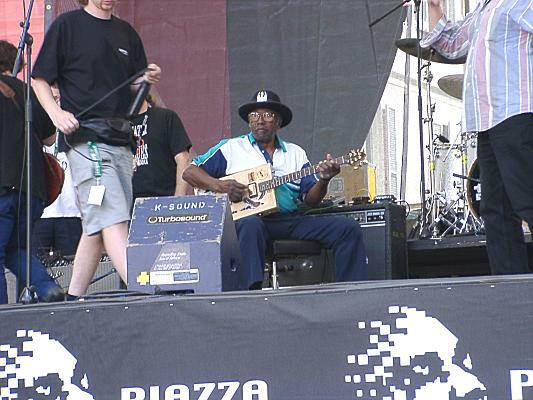 While other performers stop after 40 some minutes which is fixed in their contract, Bo just doesn't seem to care. 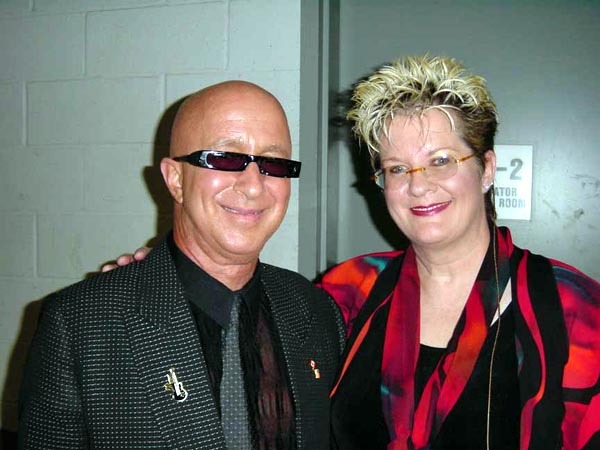 He is still a musician and not a business man. He did fantastic solos on both drums and keyboard additionally to his crazy guitar sounds. 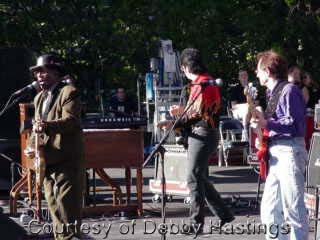 During the two hours, he played rock 'n' roll, blues, reggae and rap and there was even an encore. Set List: Introduction, Bo Diddley, I'm A Man, Can I Walk You Home, Crackin' Up, I Just Wanna Be Me, Road Runner, That Mule, Who Do You Love, unknown song, drum solo, keyboard solo, rap improvisation, Hey! 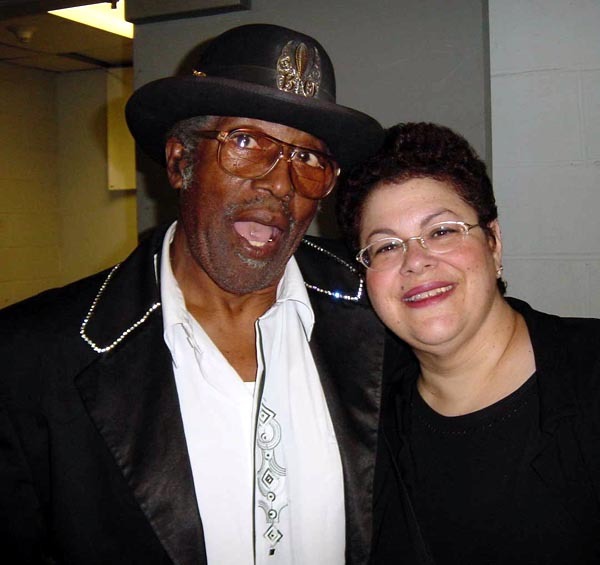 Bo Diddley, Diddley Daddy". Thank you very much indeed for this contribution, Wolfgang. 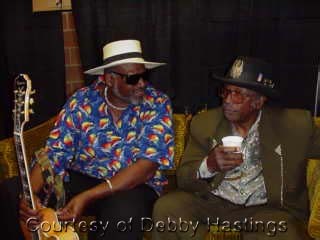 We gratefully acknowledge Debby Hastings for the above photo contributions of BO DIDDLEY and BB King and friends in concert and backstage at the BB King Blues Club and Grill in New York, NY in June 2002. 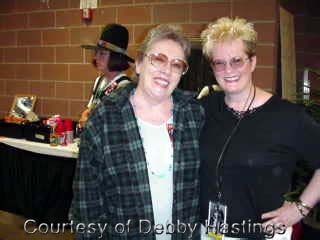 "I met Bo at the soundcheck before the show. He was very friendly, allowed pictures and signed my ticket. 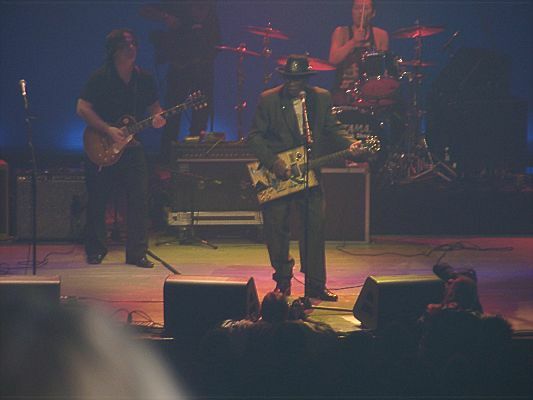 At about 11:45 PM he entered the stage and started his show with "Bo Diddley". 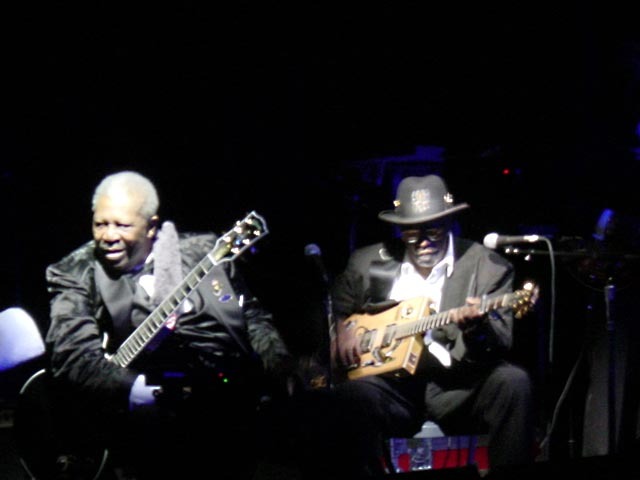 When a string of his guitar broke, he did a solo at the drums while the stage crew tried to fix his guitar. At the end of the show, he did a strange thing with his guitar and a synthesizer. His guitar sounded like a violin afterwards. After 80 minutes he left the stage, telling us how much he loves this country and thanked each and everyone of us for being at his show. 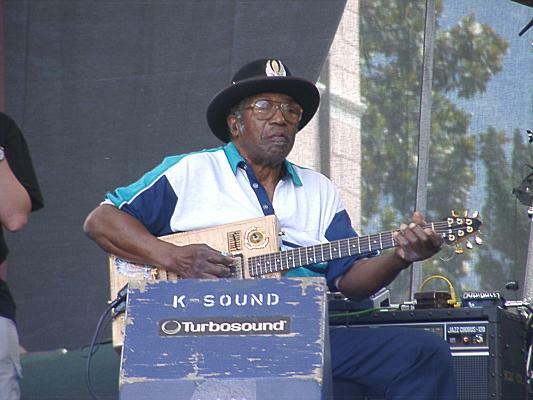 Set List: Bo Diddley, Can I Walk You Home, I'm A Man, Crackin' Up, Before You Accuse Me, Hey Bo Diddley, Synthesizer Improvisation, Who Do You Love".